welcome back to the a player Staffing agency Tulsa matchmaker. I’m here with Ethan May and we’re again just trying to help add value to employers and job seekers with unique topics about the process of getting hard. Um, and so today’s topic is five questions not to ask during your first interview. Um, and that’s the title here. So if you’re struggling with interviewing and trying to figure out why listen, that might be why we’re going to share some stories. Probably Ethan more than me, I’ve got a couple up my sleeve, but it’s been a while since I’ve done it, man. This dude right here is crank and with stories, so we’re probably going to be entertained here. I hope that yours entertained is, we’re going to be in discussing some of this. Um, but the reason this topic is important is because there are people who are really trying, trying to get a job and you know, especially if you’ve worked for a long time, all of a sudden you’re getting thrown to this interview game and you got to, you gotta play the game a little bit. I hate that. You know, sometimes you, you just want to be authentic with, but especially when it comes to the way you feel maybe about your last job, you might want to suppress some of those thoughts sometimes. And so we’ll, we’ll talk a little bit about that as well. Um, we would love to invite you to invite other people that you know of that might be seeking a job and struggling with their interviewing process. We, we really want to be a value add. We’re not trying to make any money off this. We just want to help people. And so we, me and Ethan spend a little bit of time each week to do this and we hope that we’re helping people out. But if you find this content helpful, share it with other people. Um, and then all they have to do is go to our website@trinityemployment.com and hit the click the dropdown menu of our career center. You’ll see our podcasts there and click there. And we’ve got a 20 plus a episodes now. Um, and so we need to get, we need to get going on this. Why don’t you kick us off with some statistics about how not to, how to ruin an interview. Oh yeah. I mean there, there were just so many stats about this, you know, uh, careerbuilder.com, uh, utilized Harris poll to do this survey us wide and a, and basically what they were asking is identify the biggest, like the worst things that you can do in a job. They’re asking hiring managers across the US for this. Um, this last year and in lots of answers obviously popped up. You know, I could probably list about 30 things. Don’t do that in an interview, but we’ll keep it short. We’ll just try and go over a few of them, but 60, but you’re not bitter. No, I’m just saying there’s a lot, you know, and so they, they narrowed it down a bit and we’ll, we’ll narrow it down as well. But when you realize that if you just say to a hiring manager, what is the worst thing you can do in an interview? The fact that they have these, that so many people said so many hiring managers said, that really speaks volumes to how important it is. So 66% of employers say that if they catch a candidate lying about something, they are immediately done. Disqualified. Like if there’s a, sorry, you looked like you were about to say something but no, go, go ahead and finish. I’ll, I’ll, I’ll chime in here a second. Yeah. I mean it’s just like, and this has happened to me, I’ve got a story for it. There was a woman that came in for an interview and I had her resume, I’ll print it out and she hadn’t really great work history, it looked like, and she came in and she goes, Hey, I brought you a resume, which is great. We always love that when they bring a resume. She handed it to me and I just glanced at it because I already had one. And I realized sitting there that the resume she handed me and the rest of my head, I, we’re two completely different resumes. Listen, I think that I remember you having that happen at least twice. Oh yeah, there’ve been a couple of times. And so I was looking at it and it wasn’t just like, you know, sometimes you, you make a uh, a Staffing agency Tulsa resume a little bit more geared towards a certain job you highlight and you know, certain aspects of your last job that would do well on the job you’re applying for. But I’m telling you, man, they were two completely different resumes. You remember that out at one of our largest clients. I’ve got to keep everything, you know, that, that sort of thing confidential. But um, listen, we had someone that interviewed at two different areas of that business. One time was through us and one time was through their human resources department, different departments. But the department managers had gotten together or human resources somehow figured it out. And they had provided different resumes to eat to each different department managers. But it was, it, you know, it wasn’t just catering to that job, like it was drastically different, like work history and everything was different. And so this person, uh, when they figured that out, they, they, they had hired him and then they fired him right. And immediately. Oh yeah. And so this woman, she came and she handed me this and it was two different jobs, wasn’t just two different, you know, um, catering to one, you know, skill more than another. It was like different companies, different work dates, all sorts of stuff. And so immediately, like without even talking to her, I was done. I didn’t want to hire, you know, I, I did one to, nothing to do with her as well, because you didn’t know what else was going to come out of that. But what I want to try to do for their, you know, there, there are people that are just going to flat out lie, but I think a majority of the people that are going to be listening to this, they’re, they’re likely not going to be the people that are going to flat out why. This is where you can get caught with this though, especially if you have someone help you write your resume and they’re wanting to try to, not exaggerate but uplift in cell every good thing on your resume. And so you want to make sure that you don’t have someone oversell you so that when the manager starts asking questions, they realize that was inflated. And then now all of a sudden you’re taking something that was genuinely like you probably put it down right? You had somebody enhance it a little bit, but they handled it a little bit too much. Now all of a sudden in the employer’s mind, you are now, um, uh, flagged as a potential lying risk. And so I think that is more probably along the lines of our listening audience. Sure, definitely. Yeah. I mean, very few of you guys, I think we’re just going to be completely making up your entire work history, but it reminds me of an episode of the show friends where Joey, who is an actor was hired on for some part. Whoa, wait, wait, wait, wait. You’re old enough to watch the story. The, the show friends love friends. I’ve seen all the friends like probably three or four times all the way through. Okay. Well I understand her up the story and I’m actually really interested in it. Can you Joey, this character and friends was an actor and he was hired on for a part and he was really excited, but he goes, the problem though is I’m supposed to, I think he said I got to be able to speak German and I don’t speak German or was friends that was like, I ain’t got to be able to speak French and I don’t speak French. And he said no, but it’s on my resume and the whole episode they were going through, he and people are going through all the things like, okay, can you tap dance? And I can’t tap dance. Okay, we’ll take that off your acting resume. And Are you a professional horseback rider? No, I’m not. Okay. Take that off your resume. But the idea was he was just trying to make himself more marketable, you know? And sometimes it may seem like little things, you’re just kind of adding. Oh yeah. Like I’ve used this software before. Yeah. Like, you know, excels in this type of software, you know, and really you’re barely passable at it. Things like that. If you get caught in a lie, that hiring managers just going to immediately trust 0% of what you say. Everyone now knows what you’re going to think about him if you catch them in a lie. Oh yeah, I’ll think of Joey from friends. Right, right, right, right. Yeah. Anyway, but yeah, we got way more status. I got sidetracked. Yeah. Another one, and this one’s huge. 64% of hiring managers set immediately if you pull out your cell phone and interview. See Ya, you’re done. And I agree. It just, it’s unprofessional. It’s rude. I’ve had people do it and yeah, that’s not what you want and you know, and, and if it starts to ring, just turn it off. Don’t answer the thing. Oh my gosh. That seems like, seems to, it seems like such an obvious thing. If your cell phone goes off, like that’s okay. You know, at the end of the world. Oh I’m so sorry. And you grab it, you mute it and you’ve immediately put it back down and you’re done. But yeah, I’ve had people just, uh, hold on one second. The answer. Hey on, hold on, I’m in an interview, I’ll call you back. All right, well I won’t call you back cause I don’t want to say that. Know. And also other things can’t, it appears arrogant or entitled, 60 or 59% of hiring managers if the American and they’re done with Ya. Um, 49% say if you dress inappropriately for the interview, then they’re done with you as well. I mean, these stats are, are really important because you don’t want to immediately paint yourself as a bad candidate. Yeah. Well. Um, what we want to do is start in with, with some action items here on, on things to not ask. Whenever you get a, whenever you’re in an interview. And especially, I really think this is people for just aren’t used to interviewing a lot. You’re getting back in the game. Um, these are things, by the way, you’re going to want to ask. There’s not anyone that is not interested about these things. That’s sure. Not at all, but it’s just the, it is the, uh, the, the Staffing agency Tulsa spirit that you’re going to present to two people. The Spirit’s not a good word. It’s the, it’s the idea that is going to be presented to a manager that like, man, that’s all they’re thinking about their perception and the employer that, let me tell you something that’s really selfish about the employer, but it’s just true. And it’s, and it’s true of every employer. They are only looking for what’s in this for me. And I mean, really, really it’s, it’s not that selfish because they’re going to be paying. Yeah, they’re gonna be paying for it. So they’re looking, if you’re going to go pay for, um, I don’t know, a piece of piece of candy, you’re going to be looking at what’s in it for me? Well, I want to taste this candy. That’s why you pay for it. The same thing with an employer. They’re looking at it for how’s this going to help our company? And so you need to stay in that frame of mind. At least I’m getting some number one is how much am I going to get paid? Um, you just don’t, the idea is you don’t want to come across that the only thing that you’re going to be thinking about is money. The people that I’ve hired in my lifetime and money was their number one driver. Um, holy smokes where their issues and they were a flight risk at any given time. Anyone offers them more, they’re gone. It’s a huge cost of businesses. When they hire someone who is only interested in money and they’ve got, you know, they’ve got an appetite for looking at what’s next and what’s better. Um, beat. Be Real careful with that. Anything that you want to say about that from everyone? Definitely. And again, the idea of talking about money isn’t in and of itself bad in an interview, a lot of hiring managers will ask you how much are you helping to make, you know, or some along those lines. Maybe not most managers, but there are a good amount that ask you that and that’s okay to answer the question, but if you just come out of the gate, you know, and they’re like, do you have any questions for me? Yeah. How much this position make or how much will I be making? And things like that. It makes you seem a lot more uh, yeah. I don’t know, money focused when in reality you could probably sit back and they’ll bring it up on their own. Does that make sense as well? There is a time for it and you want the interviewer to bring it up first if you can, but at around a second interview, I think it’s a lot more. Um, it’s, it’s a lot more accepted when you begin talking about money cause at that point you’re actually getting serious about it. You know, and this, this looks like it might be closing up and that’s about the time to start thinking about it, asking about it, um, and uh, in, in beginning to put that apart. But your first interviews, what we’re talking about and be careful with that. Number two, um, how much vacation time am I going to get again? D I mean these are all what’s in it for me. Questions and you need to be able to just not make it all about yourself. Yeah. Is Vacation time important? Yeah. Like do all of us want vacation time? Yeah. You know, but if that’s all you’re thinking about right out of the gate, um, you’re probably not going to be a fit for us. I cannot can tell you. Yeah. We’ve talked in previous podcasts about ways to market yourself well in interviews, good interview questions to ask. One of them that we’ve talked about in previous podcasts is a really great question to ask is like, how would you, like, how would a person in this position be successful at the company? Like how, what is a good trait of people who have been successful before that question shows that you care about the position, care about being successful, care about moving forward about, but he knowing about the position and seeking to understand more about the position rather than, hey listen, how much time am I going to be retiring? Yeah. So picture of you’re an interviewer and you’re talking to someone and they say, how do you feel people in this role have been successful before? Oh, you’re thinking, well great, that person cares about the job in the company now picture of them. And not saying that and saying so like how much vacation time would I get? Yeah, you already want to be gone from work. You know, that’s not a great way. And the same thing as the first question. There is a time for this. You should ask this at some point. The time and place for you to ask this is whenever you get an offer then begin asking you about the benefits and the vacation. And yes, you do need to consider that as part of your, uh, salary compensation. So please don’t think that we don’t think that that’s important. That is very, very important. It’s just not during the first interview. What’s our next one, Nathan? Uh, the next one is how quickly can I get promoted? Um, we’ve talked a lot about growth and how important growth is in a company, and that’s a great thing. But again, that first interview, you don’t even have the job yet. You don’t even have a second interview yet, and you’re already talking about, yeah, how can I go ahead and move up from this position, do more, be in a better position, um, that shows that you’re already not content where you’re at. Um, and that’s a good thing to talk about and to know what’s growth like in the company. Um, but, uh, but definitely not in that first interview. I’m not, when you’re just sitting there, the [inaudible] and I will tell you all, we have all gotten these questions, every single one of us. Oh yeah. And you know, just, just to piggyback on what you’re saying, you know, goodwill, that they are just not, if they’re asking that question, they are not content where they’re, where they’re at right now. And if you’re, if you don’t have a quick fast lane for them to promote, we’ll then they’re going to go somewhere else and you’re going to spend a lot of time training them, getting them up to par, and then they’re going to bail on the next, on the next thing. It’s a big costly thing. Number four, why did the company fire so many people as well? I don’t think I’ve ever gotten that one. No, I haven’t. But if I were, if I were to get that question, yeah, I would not be super pleased with it. I don’t think. Yeah, I mean I think it’s okay to ask. Um, how, uh, why is this position, is this a new position or is this replacing someone? I think it’s okay to ask that. Oh, sure. Um, but yeah, if you come out and said, why, why did the company far so many people last month? Maybe if it’s in the news or something like that, but maybe then, you know, this’ll, I will try and make the story very quick, but it reminds me, um, I am, I’m engaged to be married right now. My fiance, Kayla and I are, oh boy, I guess, which is wrapping it up. I know, right? Really Great. Uh, when we were dating maybe three months or so, um, Kayla and I had met this, um, this girl that was kind of a mutual friend of another friend and she was like, oh, so nice to meet you guys. And I had walked off to go do something and she’s talking with Kayla and kind of out of nowhere, she was like, so like Kayla, I think it’s really important. What do you not like about Ethan? You know, like what? Like what’s something that’s hard for you about the relationship? Like immediately and kill. I was like, Whoa, who are you? You know, like, well, hold on. You know, like, and I think what she was trying to get at was, you know, it’s important to know that there are things that, you know, aren’t always going to go so great in relationships, you know, and you can work through that. But hold on, hey, we’ve barely been dating like a couple of months and be, I met you 20 minutes ago. That’s not your place to attack me on that. And that’s what this question kind of feels like. Like someone who was interviewing for a job coming in and, hey, why are there so many big layoffs? You know, like, well, hold on here. You know, who are you to question us about, you know, what’s been going on the nitty gritty of our company. Does that make sense? Well, the thing is, is the likelihood of that person that you’re talking to, having a friend or someone where they watched their family, can I get deputy right? Yeah. So you bring up tears in your, I know immediately, but that’s what that question reminds me of. Like, we’re not close enough for that. So, uh, I want to leave you with three questions that you can ask during an interview. Everyone’s going to ask, Hey, do you have any questions for us? You need to be prepared. You can go to Google and top in, uh, St Paul interviewing questions to ask an interviewer and it’ll give you a lot of really great ideas. But I just wanted to give three real quick and then we’ll, we’ll, uh, we’ll get out of here. Um, what are the best attributes of this company’s culture? Um, what, uh, how, how, how much is collaboration across departments encouraged? That’s a great question. Um, what would you like the person that you hard to accomplish in the next six to 12 months? Great questions. You’re, you’re learning more about the position. I’m not just asking what am I going to benefit here and during our first interview that this is really great, helpful information. So I hope that helped you out. If Trinity can help you with your job search, we would love to be able to do that. And, or if you are an employer and you’re looking for a staffing firm, we would love to earn your respect and your trust. 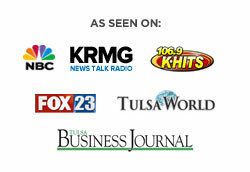 Please give us a call for all of your Staffing agency Tulsa needs.